Do you create estimates, bids, quotes, or proposals for prospective customers before you start a job? You can create your estimates in QuickBooks, email them to customers, and then convert them into invoices after you complete the work. Here’s how you do it. From the home screen, click on the Plus Menu and beneath the column heading “Customers” select Estimate. Enter the prospective customer’s name into the Choose a customer box. Either choose a customer name from the list of drop-down menu options available, or if this isn’t a customer you’ve entered into QuickBooks yet, click the + Add new at the top of the drop-down menu. Once you’ve entered your prospective customer’s name click + Details. In the Details window, enter your prospective customer’s contact info. Be sure to add their email address so you can send them the estimate. When you’ve finished, click the Save in the bottom right corner. Now enter the name of the products and services you plan to provide. If this is a new product or service that you haven’t entered into QuickBooks click + Add new at the top of the drop-down menu options. Enter information about the product or service you plan to provide and designate an income account for this product. Select an account name in the textbox marked Income Account—remember, this isn’t a bank account, it’s a bookkeeping account that goes up every time you sell this product. Click Save and Close when you’re finished. Enter the Quantity, Rate and Amount for the product or service. When you’ve got everything you need in your estimate, click Save and Send to email the estimate to your prospective customer. If you refer to estimates as bids, quotes, or proposals, you can change the word on the form your customers see. To do this rom the Home Screen, go to the gear menu and beneath the Setting column choose Custom Form Styles. On the Custom Form Styles main page, click New Style in the upper right. Select Estimate as the style you want to customize. Then choose from the styles available on the left. Go to the Header section and replace “Estimate” with whatever you want customers to see, for example the word “Bid.” Click Save when you’re finished. Give your custom form style a name and Save. Now, when you create an estimate you can choose Bid as a custom form style. When a customer says “Yes” to one of your estimates you’ll need to update the estimate status. To do this, first you need to find the estimate. From the Home Screen click on Invoicing in the left bar and select the All Sales tab. On the sales screen, click on Estimates in the QuickBooks moneybar. Select the estimate you wish to accept from the list below and click on Pending in the Status column to open the estimate for customization. Click on the Pending button in the top right and change the estimate status to Accepted. Once you’ve finished click Save and Close in the bottom right. Before you can change an estimate into an invoice you’ll need to make sure your account is set up correctly. Click on the gear menu and then select Account and Settings. In the left navigation bar click Advanced, and under the Automation section be sure that the Copy estimates to invoices option is set to on. If it isn’t, simply click anywhere on the Automation section or the pencil icon to change your settings. When you finish your work for this customer, you can convert the estimate into an invoice form your list of estimates simply by clicking Start invoice on the estimates page. If you started an invoice directly, QuickBooks will find any estimates you have open for this customer and let you add them to the invoice. To convert an estimate this way, from the Home Screen click on the + Menu and under “Customers” choose Invoice. 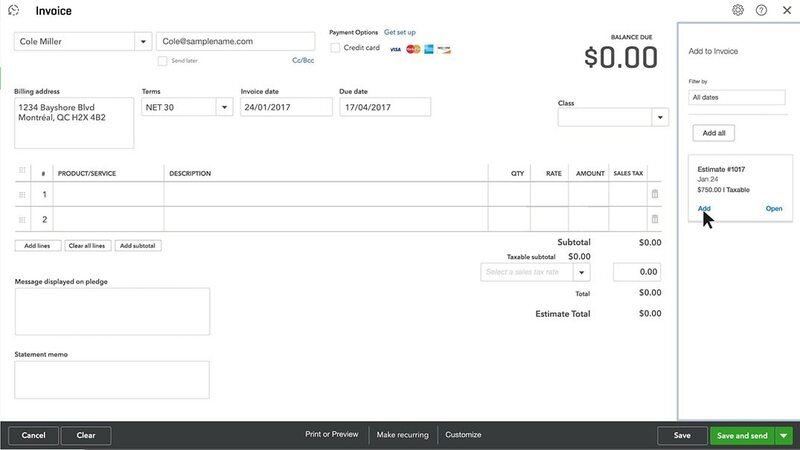 On the invoice screen, choose the name of the customer you started the invoice for. In the far right column click Add to add the estimate balance to the invoice.